Carma and I went to Sam's Club to get chicken tenders for the dehydrator and fresh veggies for the guinea pigs this weekend. The employees in the store joke around saying she is my membership card. No poodle, I have to show my card. I have been shopping at our store since the day it opened. They also ask who is with me if she isn't. They want to be able to locate the person in the store in case I (really them) need assistance. I am that person who goes in for coffee thinking I will be in and out in a bit but end up sitting on the floor, shelf or worse lying on the floor. This is due to my blood pressure bottoming out without warning. I have instructed them not to call 911 unless I am bleeding. They follow the ADA but I have shared with them what Carma does, what to do if they see her coming to them without me, and what to do if I need assistance. My warning system is my poodle. Carma Poodale IS a TRAINED Service Dog. 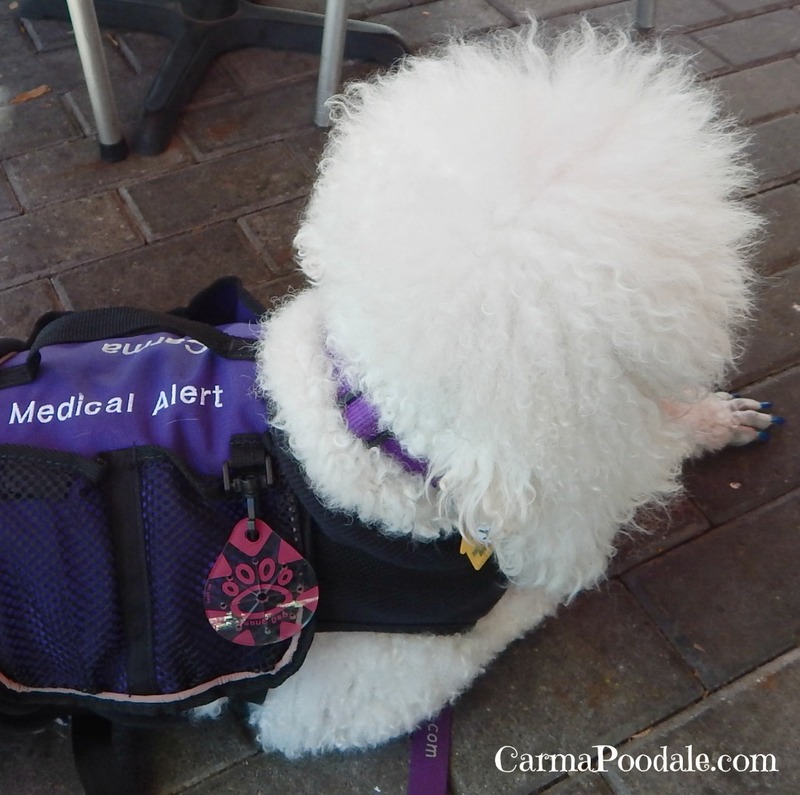 Carma Poodale is a medical alert service dog to be exact. She can alert me before something happens. She has also pulled me right out the door to the car making me leave my cart full of groceries in the store. With all that being said, I want to share what NOT to do if you see a dog in a store that is not pet friendly. 1. Do not start pointing and yell out "Hey there's a dog!" - I know she is a dog. She knows she is a dog. The people that passed us know she is a dog. 2. Expect my dog to calm your child who is crying- There have been so many times I have been in a store and heard a screaming child. Once that parent sees me they start telling their child "look at the puppy/dog"
3. Say loudly "I didn't know pets were allowed here! "- They're not. Pets are not allowed. Carma is not a pet. She is a medical device that was trained to do the job that she does. 4. Follow a handler around asking questions like "how can I bring my dog in here?" ,"what is wrong with you? ", "What does she do? ".- We are trying to get our groceries, prescriptions, items we need. We are not there to answer questions on how to bring your dog with you or answer personal questions about our disability. 5. Follow us around telling us how you or someone you know registered their dog, cat, ferret as a service animal or how you have a service dog. The ADA states that only dogs and in some cases miniature horses can be service animals. There are no formal registrations for service animals. After listening to this person I see that it is only a "service dog" when they want to take it somewhere. It isn't trained and they purchased a vest and ID card off the internet. 6. Tell your child to go over there to pet the dog- NO just NO. We are not there for the purpose of being a petting zoo. We are regular people that have a disability who only want to do our shopping and go home. 7. Don't assume you can guess our disability. - Over the years I have learned to ignore people who follow behind me asking if their child can pet my poodle. I am trying to get my items so I can get out of the store. I have heard everything from "I think she is deaf", "she must have something wrong with her legs due to her limping" "Wonder if she is blind and deaf". 8. Don't get upset and start screaming at us because we refuse to allow you or your child to pet our service dog. - Yes, I have had people go off on me due to me saying No. You make yourself look like a fool in front of everyone watching. Once again I will repeat, my dog is a medical device that keeps me safe. She is not there to be petted. If you want to pet dogs please go volunteer at a animal shelter. Those animals would love the attention. 9. If you come in view of a service dogs and you are afraid of dogs, please do not start screaming on the top of your lungs. - Seriously, it has happened to me more than once. The last time it happened I was once standing at the service desk of a major retailer when a woman and her daughter came in. Carma was laying beside my feet while we waited for a manager. As soon as her daughter saw Carma she started screaming on the top of her lungs. Her mother stood there staring at me while holding her daughter. Everyone in the checkout lanes stopped what they were doing to see what this child was screaming about. I had to raise my voice over the screaming child to tell the mother to keep on walking past us. We were 20 foot from each other! I still don't know how they even seen Carma laying on the floor. 10. Make kissy noises, bark , let your child try to scare my dog, try to call our dog over to you or keep telling her how pretty she is.- Carma doesn't like kissy noises and she knows she is pretty. You don't have to keep telling her that. She is trying to do her job, she is ignoring you. My dog won't come over to you no matter how much you call her when she is working. She is a working girl that is serious about doing her job. This technique will not work with any trained service dog. Service dogs are trained to ignore you. 11. Don't do a walk by petting- Yes, I have had people who have walked by us numerous times and each time will run their hands over my dog. STOP IT! I don't want your hands touching my dog's hair. You could have just coughed in your hands and now your germs are on my dog, you may have picked your nose and your booger is now on my dog. Just STOP IT. I will catch you and I will say something to you. I work hard to make sure my dog is clean and clean looking when we are in public places such as restaurants and stores. I spend hours a week brushing her and giving her a bath which is both a killer on my back and arms. Don't touch a service dog without the handlers permission. When you see a service dog in a non pet store know that the dog is taking care of their disabled person. Please be courteous and allow us to shop in peace. Great article. I think that the general public doesn't understand the relationship between a service dog and it's owner - they don't get it that coming between a service dog/owner is like interfering with someone who must use a wheelchair - just don't do it. Then there is that segment of the general public that doesn't care what their own interference causes. If I ever do get a service dog and any of your experiences happen to me - I may be the one doing the yelling. 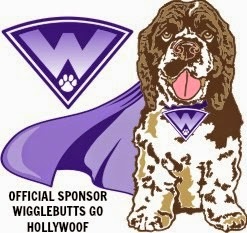 Any of the things I have mentioned above have happened to many service dog handlers. Anytime you are in a store with a dog, it will bring more attention to you. Fantastic post and I cracked up when I got to the part with the child screaming. Jeez. I think what's confusing is the difference between the designations. I see people with "service" animals all the time and they allow people to pet them. I only pet dogs if they approach me and don't have a "don't pet" jacket on and after asking their owner/handler. This way I'm safe from offending anyone. And how can anyone think it's okay to ask someone what their disability is? That's just rude. But I shouldn't be surprised. Someone recently emailed me to ask how I lost to dogs in a short period of time; she found it hard to believe. Yeah, slap in the face. But people just don't think before opening their mouth. Thank you Kim. I still believe the parent is the one who seen Carma and pointed her out to her child. You would have swore the kid thought that Carma was about to jump out and grab her neck. Even the service desk employee said that woman acted like a idiot and was happy I spoke up. According to Americans with Disabilities Act (ADA) our dogs do not have to wear any type of garment. It really doesn't matter here. If I had DO NOT TOUCH wrote all over Carma's body, there would be someone who still touched her. Carma wears a vest when we travel or go to places out of town that doesn't know us but here she wears a scarf that says "Service Dog". I put it on her and hope people in the stores or restaurants do not bother us. Sometimes it works , sometimes it doesn't. It's terrible how people don't respect working service dogs. It's also terrible how many fakes are out there who probably give other people false ideas about service dogs. Many people don't think fake service dogs (those who purchased a certificate or ID online) and the ESA (yes they have doctor's letter but it doesn't give public access) are what makes it hard for service dog handlers. I love this. And regarding #4 it's amazing how many times I've seen the "what's wrong with you" question being asked to someone with a service dog. I'd never in a million years ask something so personal & insensitive to a stranger, I just don't understand. I have been asked many times. Usually I give a general talk about how she helps me with my MS to help that person understand the importance of a working dog. It depends on my mood and whether I have noticed them following me around creepily. I told one woman that my dog helps to stop me from biting people. :D She left me alone after that. LOL! Very good! It's sad but people just dont know this! This is such a great post. Amazing to me that so many people can be so insensitive and disrespectful! Pinning. Good post - most people don't know. What I do when I see a service dog or any other animal in a store.... I just assume they are there for the purposes of the human, respect that and smile at the human and keep on keeping on! Thank you for being that respectable person. I know I don't mind when people look at Carma. I have seen many who have scowled faces such as one who has had a terrible day and watch a softer look come across their face when they catch a glimpse of her. It makes me feel a little better when I see people smile as they pass us. That may be the only smile they had all day. Great information, thanks for sharing. So many people have absolutely no clue about service dogs. I appreciate you providing some enlightenment. Thanks for sharing those valuable tips. When I encountered a service standard poodle in a store here I made sure not to distract her. But then the owner told me she was "off duty" and we got to chatting about how much we love our poodles! Is it acceptable to offer assistance? I was in a store once and a woman with a service dog was there. She was trying to get something from the shelf to the cart. I wanted offer to help, but the dog looked very serious and I didn't want to approach without knowing it was ok. She was able to do it, but help could have made it easier. I didn't want tobioset her or the dog. Thanks in advance. Yes if you see a handler struggling to reach something, please offer help. I know ma does appreciate when someone offers her help. Not saying everyone is like us but many are. I know she doesn't like when she is riding in a cart and needs something from the top shelf. You can always politely ask if they would like your assistance. 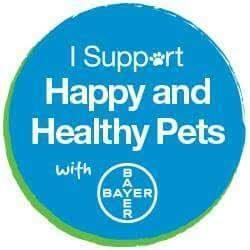 They may be happy someone cared enough to help. Thank you for stopping by and reading my post. If you ever have any questions, feel free to reach out to me. I want to educate everyone.